The Quicksilver Mine Co. will present a one-woman exhibition of recent work by Forestville painter Robin Eschner beginning March 18th. This Show will continue through April 24th. Working in acrylic, Eschner’s paintings are filled with characters who seem almost to tell a story over time. 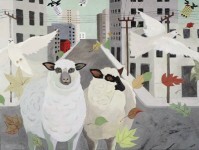 Dogs and doves, crows and roses and other plants, buildings, objects, and animals inhabit a shared landscape. "There is a way in which these characters hold steady through time and changes in scenery, through the sudden arrival of new friends or strong winds," says Eschner. "Sometimes someone leaves for awhile...and then reappears, entering the canvas in a new way. You could say that everyone involved is held together by very little—here is a song, here are these colors, these layers of paint, and now—the sound of wings. And yet...friendships have formed, a history is taking shape, a story being told." Robin Eschner has exhibited recently at the I. Wolk Gallery, St. Helena; Bakersfield Museum of Art; Pratt Manhattan Gallery in New York City; and Edith Caldwell Gallery, San Francisco. She also collaborates artistically with Oregon writer Barry Lopez, including several limited edition books, Apologia (1997) and The Letters of Heaven (2000), both published by Lone Goose Press. 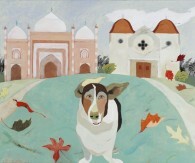 "Waiting for God on a Windy Day,"
This Exhibition opens with a reception for the artist on Saturday, March 26 4-6 p.m.